It was succeeded by Project Enable. The original idea for a county economic plan was brought forth by Board of Supervisor member Kenneth C. Boyd who was looking to change the way the county engaged with the business community. Its overriding goal is to “increase the County’s economic vitality and future revenues through economic development by expanding the commercial tax base and supporting the creation of quality jobs for local residents.” In collaboration with a number of different groups, including the Thomas Jefferson Partnership for Economic Development, the Charlottesville Regional Chamber of Commerce, the public, and sustinability advocacy groups, an economic vity plan was created. 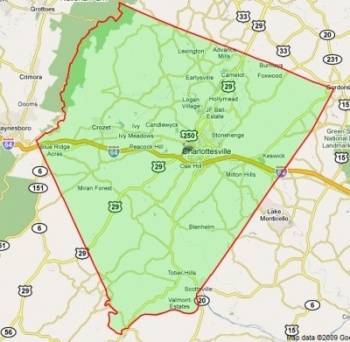 The Albemarle Economic Vitality Action Plan was adopted on August 4, 2010, by the Albemarle County Board of Supervisors. The County will improve communication with the business community through direct engagement and through strategic partnerships with the Charlottesville Regional Chamber of Commerce and the Thomas Jefferson Partnership for Economic Development. “Business targets” will be developed to match desired industries with County business representatives to form an economic relationship. Likewise, the County’s Business Development Staff will play a more proactive and visible role in engaging with the business community. County Business staff and business representatives will meet to review how county policies impact business decisions and functions. This way, County officials can have a better understanding of what issues the business community is most concerned with. Virginia Economic Development Partnership (VEDP) - County staff hosted a familiarization tour for VEDP staff. Virginia Economic Development Association (VEDA) - County staff and City economic development staff cooperated to hold the spring VEDA conference. Virginia Department of Agriculture & Consumer Services (VDACS) - County staff participated in a statewide agri-business. Chamber of Commerce - County staff and the Chamber of Commerce Board of Directors discussed the County's action plan. The County is hoping to simplify a recognized “complex plan review,” that creates unnecessary barriers and requirements. It hopes to more easily administer decisions about a business’s environmental impacts and other concerns as it relates to community values. Likewise, more efforts will be made to better collaborate with businesses to adhere to development standards. This strategy is aimed to help entrepreneurs who may have little prior experience to the development review process. The County has already taken steps through this objective by holding a work session with the Board of Supervisors to review the process for Certificates of Appropriateness (ARB Review). Small Business Tookit - County staff is on the verge of generating a toolkit to attract small business owners to Albemarle county. Farm Winery Zoning - The Board of Supervisors loosened the farm winery zoning regulation. The plan looks to build a special relationship with UVa, UVa Real Estate Foundation, and private and non-profit sector employers to create a new set of attractive job opportunities to local residents. Particular emphasis was given to supporting existing local enterprises, as opposed to newer entrepreneurs, however not excluding new enterprises from the process. The County will provide direct assistance to local entrepreneurs to nurture small business growth. This will be done in coordination with the Regional Chamber of Commerce, TJPED, UVa, the Small Business Development Center, the workforce network, the Albemarle County Public Schools and other stakeholders. Information will be gathered to identify workforce needs of specific industries. In accordance with Albemarle County’s business development objectives, target enterprises will be determined to find industries the best suit the county’s needs and the community’s values. These target enterprises will receive the bulk of county support through existing business services, site selection assistance, and workforce development efforts. Fiscal and ecological impacts will be taken into consideration when determining target enterprises, as well as finding if the industry helps the County satisfy its infrastructure needs. Workforce training programs will be built in collaboration with Piedmont Virginia Community College, the Workforce Training Center, University of Virginia and the County school system by the first half of 2011. TJPED data will be used to provide an online feedback loop for local policymakers to determine effectiveness of actions. Finally, efforts will be made to match growing employment opportunities with residents and to determine training or retraining programs for dislocated or low-income workers, as well as youth populations. Local job opportunities will be marketed and matched to residents with similar skills through a multi-channel approach. CustomInk - This company extended its business to Albemarle County. MicroAire - MicroAire acquired the former USPS building and expanded its operations to Albemarle County. Target Industry Study - The Board decided to move with a Target Industry Study to efficiently use its assets to provide economic vitality. Board of Supervisors/School Board Business Leaders Roundtable - County staff and School Board staff met with community business leaders to develop economic strength in Albermarle County. Albemarle Business First - This program is outlined to improve the county's business climate. The county will work to consider amending the zoning ordinance by relying more on industrial performance standards rather than adhering to a specific list of uses for a particular zone. Likewise, efforts will be made to stop the conversion of properties zoned for light industrial to commercial zones. It is widely noted throughout this objective that the environmental and community impacts of an increased industrial presence will be heavily considered by the Board of Supervisors in carrying out written strategies. Industrial districts' uses and commercial and industrial setbacks and beffers - County staff attended a work session and met with state officials to gain an understanding in statewide industry trends and zoning trends. Industrial districts' performance standards - The Planning Commission tentatively delayed this item until the end of May. The plan outlines a process to assess the effectiveness and impact of current investments and programs in the local agri-economy. County staff will work in collaboration with all involved actors (public, private, and others) to consider innovative, and sustainable rural businesses. For example, wetland banking and voluntary carbon banking. After the roundtable talks, ideas and conclusions will be presented to the Board of Supervisor to further consider policy. Additionally, with the new information, the County will refine and set new goals for the agricultural industry and tourism. The plans calls to “identify target areas to more aggressively promote in support of agriculture, local agriculture industry and tourism. Monticello Artisans Trail - Businesses registered to participate in the trail in Nelson and Albemarle Counties. Agricultural Economy Roundtable - County staff had a discussion to examine agritourism activities and emerging trends in Virginia. Agritourism: It's More Than a Farm Tour - The county and other entities held a forum for local residents to develop a farming-tourism. Journey Through Hallowed Ground - Staff is attempting to develop a regional program to promote the local economy. ↑ Web. Supervisors adopt pro-business “action plan”; Call for increased economic development, zero-based budgeting, and reduced property taxes, Sean Tubbs, Charlottesville Tomorrow, 6 Jan. 2010, retrieved April 7, 2019. ↑ Web. Nature of growth debated at economic development roundtable, Sean Tubbs, June 24, 2010, retrieved December 13, 2014. ↑ Web. Board considers economic development in three hour work session, Sean Tubbs, June 4, 2010, retrieved December 13, 2014. ↑ Web. Supervisors delay decision on economic development action plan, Bridgett Lynn, July 16, 2010, retrieved December 13, 2014. ↑ Web. http://www.albemarle.org/upload/images/Forms_Center/Departments/Board_of_Supervisors/Forms/Agenda/2011Files/0504/EconomicVitalityActionPlanES.pdf, County of Albemarle, County of Albemarle, 4 May 2011, retrieved 14 May 2011. This page was last edited on 7 April 2019, at 14:33.